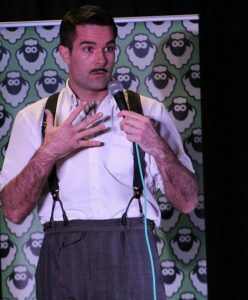 Troy Hawke, the latest character from comedian Milo McCabe is as believable as he is blisteringly funny. This is no mean feat however as convincing character comedy is very difficult to get right, not only does the performer need to make the character perfectly believable but the comedy has to be spot on too. Fortunately, Troy Hawke is a perfect example of how funny things can get when the comedian gets both sodes of the equation right! Having been home schooled by a mother who was very much tied to the past, Troy engages with the 21st century like someone who has spent the last forty years in suspended animation. This idiot savante dresses like a matinee idol, speaks in perfect received pronunciation and is completely at odds with the world around him. Whether recounting an afternoon at the football with ‘the chaps’ or engaging in ‘audience badinage’ with the front row you can be sure the laughs come thick and fast.